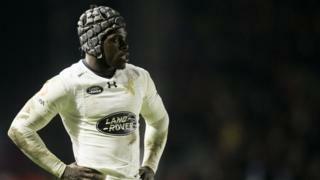 One of the most famous black players in the Premiership says rugby union isn't doing enough to get ethnic minority children from state schools into the game. 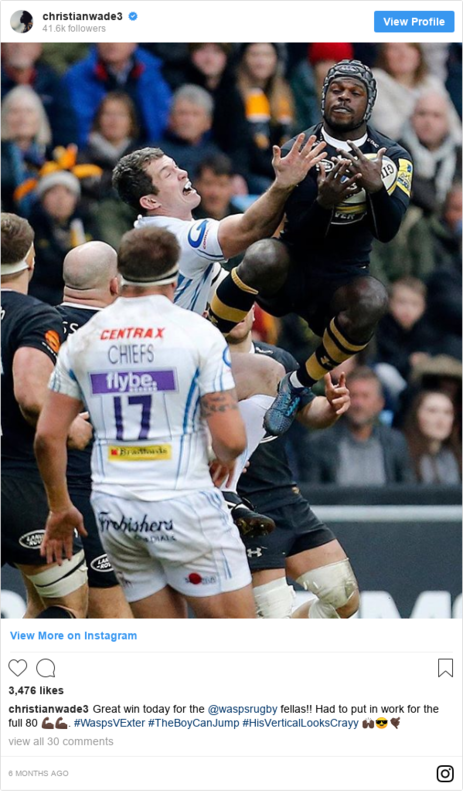 England and Wasps wing Christian Wade says the sport still suffers from a "white, public school" image.He believes that big clubs are ignoring a large pool of untapped talent.The 27-year-old told Newsbeat he wants to set up a foundation to give state school players more opportunities. "I think there is probably a lot more that can be done to integrate everyone and make it more diverse," Christian said. "There is a lot of talent out there in normal secondary schools that can be transferred across." The winger, who passed an exam to go to a grammar school, says he regularly receives messages from black kids struggling to get a break. "The amount of Instagram DMs and posts from kids who look up to me and want to play rugby, but don't know how they can get into good clubs that will give them an opportunity to get scouted, is endless. "He says clubs are still attracted to private schools where rugby is played more often than in the state system. According to the Independent School Council, only 7% of children in England under the age of 16 are privately educated, but 68% of players in the England squad for the last Rugby World Cup in 2015 went to fee-paying schools (21 out of 31).This compares to just 13% of the England squad at the 2018 football World Cup in Russia (three out of 23). "Rugby union definitely has a private school image," Christian agrees. "We need to reach out a lot more." "Not a lot of state secondary schools have a full rugby programme like the private schools do," says Christian, who finished last season as the Premiership's top try-scorer.He believes clubs tend to target private schools to work with instead of secondary schools "because a lot of the work has been done by the school already". "Although I went to a grammar school, we were lucky enough to be on the same circuit as the private schools. I feel that was my way of getting into the system." All five of the English born, black or mixed-race players selected by England to tour South Africa this summer were at least partly educated in private schools.Harlequins prop Kyle Sinckler went to state schools until the age of 16, but moved to the fee-paying Epsom College shortly after the London club signed the tight-head to their academy. Sinckler went on to make his full England debut in 2016 and has since won 13 caps for his country. "You can't just hand out hundreds of scholarships all the time," Christian argues. "There will only ever be a handful who can benefit from that. "To get kids into private school you obviously need money, which not everybody has. I was lucky, because I'm not from a wealthy background. "Luckily I had a little bit of brains to get into a grammar school but, if I didn't, then it could have been a different story for me." Premiership Rugby points to its "Hitz Programme", which works with more than 2000 14 to 18-year-olds every year, as evidence it is trying to make the sport more accessible. It says its "Project Rugby" initiative, in partnership with the RFU, is also aimed at increasing rugby participation from under-represented groups such as the black and Asian communities and those from poorer backgrounds. Christian, who made his England debut in 2013 and toured with the British and Irish Lions to Australia in the same year, now wants to set up his own foundation to help those less fortunate. "I want to do it while I'm still playing, as that will probably be when I'm most powerful as a rugby player. "I try to get myself involved in any events where I can help these guys and speak to them about what they could do. Christian acknowledges there are efforts being made to break the public school stranglehold in rugby union, but believes the pathways to the professional game remain very difficult for the vast majority of children from lower income backgrounds.It's this reliance on the private school system that he wants to try to challenge. "I'm always open to giving advice and helping them get into clubs. "I want to give them my experience, mentor them and hopefully maybe even help them out financially as well. "Follow Newsbeat on Instagram, Facebook and Twitter. Listen to Newsbeat live at 12:45 and 17:45 every weekday on BBC Radio 1 and 1Xtra - if you miss us you can listen back here.